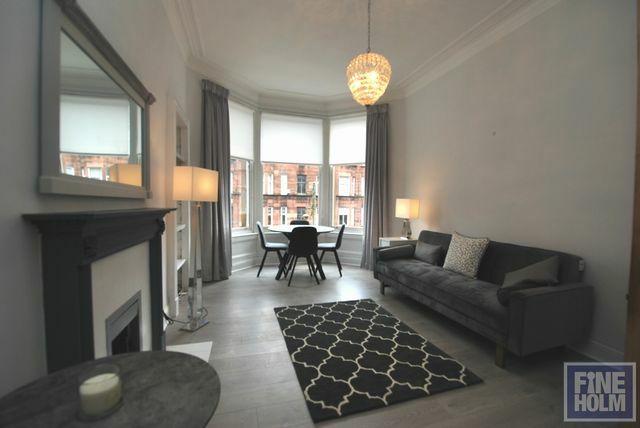 Stylish two bedroom flat in superb condition in this popular Hyndland pocket. This two bedroom tenement flat is located in the popular Hyndland pocket and offers fantastic accommodation for a professional couple, single person or professional sharers. This flat is offered fully furnished, and comprises entrance hall, spacious living room with bay window, feature fireplace and kitchen area in recess which has high gloss white units and low level lighting, 2 generous double bedrooms and bathroom with shower over bath. GCH. Secure entry. Generous store cupboard. The flat is offered in genuine walk in condition having been recently redecorated. It is positioned in a well kept stair and has communal gardens with drying area to the rear. Dudley Dr is within the Hyndland pocket offering access into the city in 10 minutes by overland train from Hyndland train station which is a minute's walk away. There are many independent shops, bars, restaurants and coffee shops a short stroll away on Hyndland Rd. Byres rd is within a 15 minute walk.